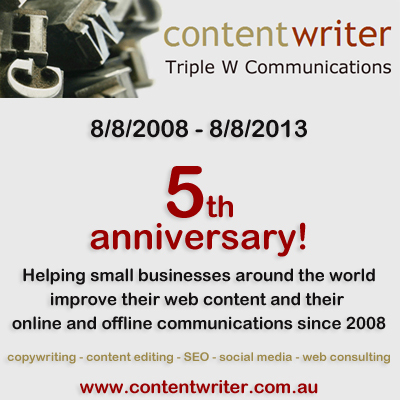 On the lucky date 08/08/08 I officially launched Content Writer, a specialist web and SEO copywriting business. By that time, my website had been up for eight months, and enquiries had already started to trickle in. Over the next few months, that trickle became a stream, quickly turning into a river. In fact, I had to put measures in place to ensure I didn’t get flooded over the next few years. Yes – I’m happy to say that my business was a success from day 1. My skills were needed, used, valued and appreciated. And 5 years on, they still are. And I still absolutely love what I do. Other than an email sent around to some web design companies when I’d just launched to let them know I existed, I have never done anything in particular to promote my business. There was no need to spend money on advertising. My website, which I had carefully optimised for strategic keywords, drew potential clients to me. And my track record, writing style and proposals convinced many of them to use my services. Over the past 5 years, I have worked for well over 200 clients from 12 different countries. Dozens of those clients are repeat customers, coming back to me with more projects. Of course, since 2008 more and more copywriters caught on to the fact people were looking for writers who knew how to write effective copy for websites and how to optimise that copy for search engines. Web copywriter became a real job. Competition increased. But so did the number of websites needing help. So there’s enough work for everyone. With more competition, it’s harder for new copywriters now to get to the top of the search results. I know I was lucky to be one of the first, when it was still relatively easy to rank well. So if you’re reading this and just starting out in the business, you probably can’t rely just on your website to get work. You will have to work harder at getting noticed. And at convincing potential clients to use your services. However, in all these years, I’ve never had a day where I didn’t have confirmed work lined up, so competition hasn’t hurt me. I firmly believe there will always be enough work for me. Also, the more clients you have worked for, the more repeat business there will be (if they’re happy with your services, which my clients overwhelmingly are). Even with search engine algorithms changing over the years, the value of quality copywriting using the right words for the target market hasn’t changed. No Google update will ever destroy good web copywriting. There will always be a need for that. Yes. Quality web copywriting. That’s still the core of what I do. Making people trust, understand, and buy from your business – by using the right words, talking directly to your target market. But I do more than that. My services range from copywriting and editing to consulting, SEO advice, social media marketing, website reviews and training. Thanks for listening and for being part of the journey. I’m ready to start my next 5 years in this exciting business!